Having trouble picking out a gift for mom? Here’s a list of 10 items that any traveling mom will love whether she’s to going Poughkeepsie or Patagonia. Everyone knows that the new TSA rules are designed to keep us safe, but they can be a major hassle, too. Remain seated for the last hour? What if you need something from your carry-on bag stored above? SeV Evolution JacketThere is an approved solution already on the market from SeV/SCOTTEVEST Travel Clothing. I’m a huge fan and rarely leave home without my SeV women’s travel vest. Easy-access pockets designed for specific items travelers carry, such as boarding passes, ID, cameras and much more. Icons stitched onto the interior pockets act as a map to help you find what you’re looking for without fumbling. SeV’s patented Personal Area Network (P.A.N.) - which manages wires and earbuds through the jacket’s lining, keeping them from tangling. Clear Touch fabric, which allows a traveler to see and control their iPod® (and cell phone, when appropriate) through the fabric without removing the device. NoBulge™ pocket design - just because you wear your carry-on, you don’t need to look like it. Weight Management System™ engineered to balance the weight from these added devices. This system is much more ergonomic than wearing a bag that puts all the weight on one shoulder. To see the full line of SeV clothing, visit www.scottevest.com or The Travel Store at EllenBarone.com. I’ve joined a group of 15 top travel bloggers to celebrate the season and bring our readers the chance to win some cool prizes, including hotel gift cards and overnight stays, digital cameras, travel guidebooks and DVDs, and luggage and camera bags. Today the Caravan stops right here at EllenBarone.com where we’re giving away a nearly $300 worth of prizes. Two lucky readers will be randomly chosen from all eligible* entries to win a new day pack from First Ascent, the guide-built adventure line from Eddie Bauer. Or set off on your next adventure in a brand new travel outfit from ExOfficio including; 1 Shirt, 1 Pair of Pants and 1 Pair of ExOfficio Underwear. 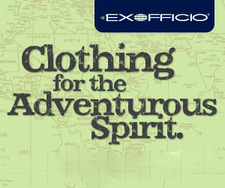 Set off on your next adventue in a complete travel outfit from ExOfficio. Keeping the meandering adventurer in mind, ExOfficio apparel is engineered to be worn again and again, pushed as far as you push yourself and still look great when you’re through. I’m a huge fan of all thing ExOfficio. What about you? Post a comment on this blog and you could be setting off for your next adventure in the latest ExOffico travel outfit including; 1 Shirt, 1 Pair of Pants and 1 Pair of ExOfficio Underwear. My feet loathe the confinement of shoes. I’m more a year-round sandal-wearing kinda gal. In fact, I first fell in love with Keen footwear when I found myself wearing their cushy Barbados sandal non-stop during a six-month stay in Mexico. Whether I was walking over crudely cobbled streets, beachcombing or wading into the surf, you can bet I had my Keens on. The color never faded, the sturdy soles withstood daily use like a pro and the unique Keen toe protector stood strong against dropped objects and the vagaries of uneven sidewalks. At home in the mountains of southern New Mexico, where a slip-in won’t cut it on warm-weather trail hikes, I upgraded to the Keen Whisper. Its quick-draw elastic cord means no slipping and sliding. Better still, the Whisper is sturdy when the going gets tough and perfect for river crossings. When I signed on for a walking vacation in France and terrain that clearly called for something more substantial than a sandal, again I turned to Keen. Enter the Keen Targhee II hiker shoe: The waterproof cross-training shoe delivered just what the trip demanded: tenacious traction, sturdy ankle stability and best yet, foot-lovin’ comfort. Favorite feature: Compared to my Vasque hiking boots, these shoes are feather weight. That alone had my feet smiling. 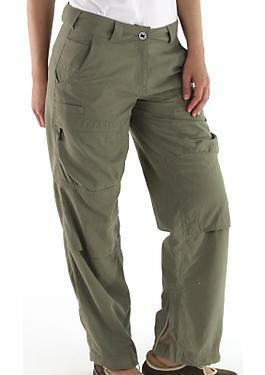 But I knew they’d passed muster when I started wearing them off-trail. They’re on my feet as I type, and I’m in Baja! It’s winter here, so the sandals come out for walks on the beach. But morning and night, I’m wearing the hikers. I’m no stranger to travel clothes. In fact, I base most purchase decisions on whether said shirt, sweater, pants, skirt, etc. will travel well. Dry clean only: Not gonna happen. Quick-dry, wrinkle-proof, lightweight: Now we’re talking. When I went searching for a pair of travel pants for an adventure trip in Baja, I struck gold with ExOfficio’s Nio Amphi pant. They had me at Repeloff and cinched the deal with drop-in cell pocket (So sue me, I travel with a BlackBerry). Better yet, after the morning chill burns off, and the heat of the day cranks up, I’m diggin’ the roll-up feature that turns pant to sylish capri with a simple button. No need for dorky zip-offs. Shopper’s remorse? Not me. It’s day 13 in Baja and I’m in love. The first thing you’ll notice about this winter featherweight is that’s no scratchy wool cardigan like your granny would wear. Not this sweater. Eddie Bauer’s new First Ascent Downlight® Sweater is cozy to the core, indoors or out. As autumn turns to winter in the mountains of southern New Mexico, I wear it on the trails, enjoying an early morning cuppa on the deck, or seated at my computer. 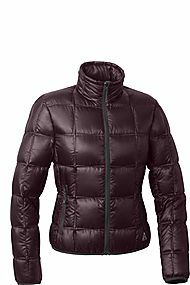 Made from water-repellent, ripstop fabric and 800 fill northern European goose down, it’s ultra light, ultra warm, ultra cozy and better still, designed to fit my curves. I’m just back from shooting a seven-day walking tour in France where I travel-tested the Sahara 217 F by Naneu Pro, a manufacturer of innovative camera, video, laptop and portable audio cases. Finding a camera bag that can meet the demands of an adventure travel assignment is a challenge. I’m happy to report that the Sahara 217 F was up to the task! Initially what caught my eye was the Sahara’s water-resistant rugged construction, as did it’s carry-on sizing and its heavily-padded laptop compartment. I wanted a pack that could double as both a notebook backpack and a multi-functional camera bag. 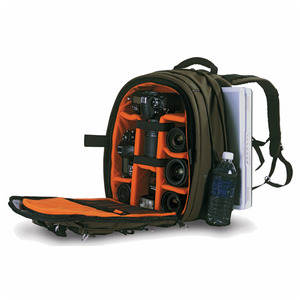 The Sahara 217’s expandable main compartment accommodated everything I needed for the shoot: 2 digital DSLR camera bodies, a full range of lenses including a long zoom, as well as 2 portable hard drives, memory cards, sensor brush, power cords and flash.